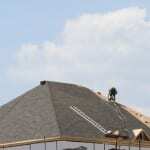 One home improvement job that most people would never want to attempt on their own is roof installation. It’s a project that requires a huge amount of work, as the surface area of your roof is bigger than you think it is. If you are one of the few people thinking of installing your own roof, we at Slippery Slope Roofing want to lay out some reasons why you should consider letting us do it instead. Experience- One reason that you’re better off with a professional roofer is that they have the necessary experience and training to do the job. Roofing contractors put in hundreds of hours of work to learn the best techniques for roof installation and have worked on hundreds of roofs during the course of their careers. Even if you’ve helped on other roof installations in the past, anyone who doesn’t work on roofs for a living just can’t match the experience of a pro. Safety- As mentioned, roof installation has unique safety concerns that the average property owner is not trained to deal with. Professional roofers have the right equipment and training to work up on rooftops with minimal risk of injury. Quality of Work- With the high degree of experience comes knowledge of the best materials, tools, and techniques for roof installation. Professional roofers will produce a higher quality of work than you could manage on your own not only because of their longer practice, but also because they have access to the highest quality materials and will use the best options for your home or business. The combination of high-end materials and expert skill will ensure that your roof is installed properly and efficiently. If you need a new roof installed, save yourself time, money, and risk by calling a professional roofer instead of taking the do-it-yourself approach. Call us at Slippery Slope Roofing to learn more about how much our roof installation services can save you in the long run.